Genealogy and fishing have a lot in common. They both require lots of patience. They both have lots of tools that facilitate the “big catch”. I wrote last week about Newspapers.com. I showed examples of how to make clippings and attach them to an ancestor profile on Ancestry.com. 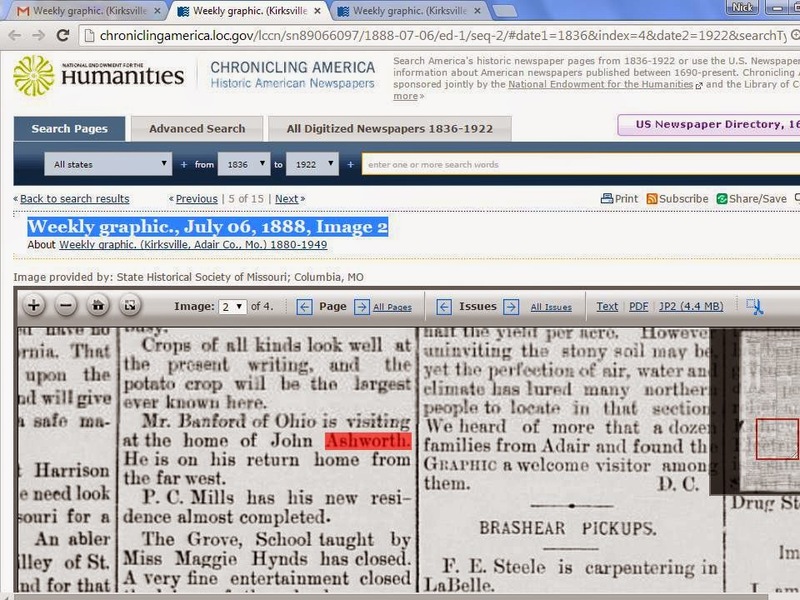 I was using the surnames “Banford” and “Mayne” to search in the Cincinnati newspapers at Newspapers.com. When you are fishing you can use a pole, a spear or a net. When you research newspapers online using keywords it can be like using a spear or a net when you are fishing. For example, the spear approach is to use the full name in quotation marks such as “George Banford”. The net approach would be to use just the surname “Banford” to find all instances of matches for persons named Banford. If you want to use a bigger net then you might start using the surnames of the relatives, friends, associates and neighbors. For example, George Banford was married to Mary Nevin. Two of Mary’s sisters, Jane Nevin and Magdalene Nevin were both married to Stephen J. Ashworth in Schuyler County, Missouri. So Ashworth is a name that I also want to search to learn more about George and Mary Banford. The State Historical Society of Missouri has made many Missouri newspapers from the post Civil War period available at their website. I began by searching the Schuyler County paper, the Lancaster Excelsior at the Historical Society Website. I found this very intriguing article about George and Mary Banford (nee Nevin) that also mentions George’s mother-in-law, Nancy Navin (spelled Nevin in other records) and his brother and sister-in-law, Stephen J. Ashworth and Magdalene Ashworth (nee Nevin). This article adds an interesting footnote to the narrative of the life of George Banford. Born in County Fermanagh, Ireland in 1828, he immigrated to America in 1853 according to the 1900 census. He settled in Schuyler County, Missouri. On 31 March 1859, he married Mary Nevin in Schuyler County. In 1860 he was enumerated in the U.S. Federal Census with his new wife and they were residing next door to his in-laws, Thomas and Ann (Nancy) Nevin. Some time after the outbreak of the Civil War, he left Schuyler County and relocated near Cincinnati, Ohio. "The Civil War caused many hardships for Schuyler Countians. Although Missouri was a free state, enlistments in Schuyler County were almost evenly divided between Union and Confederate forces. Neighbor no longer trusted neighbor, and families were divided in loyalties. Bushwhackings and skirmishes occurred throughout the area. Some families left, unable to live under such stress." Apparently George and Mary Banford left Schuyler County without disposing of all of their real estate as indicated by the clipping from the Lancaster Excelsior. Another intriguing article was found by searching for Ashworth in the Adair County, Missouri newspaper. The Historical Society of Missouri website redirected me to the Chronicling of America website. Who is this elusive Mr. Banford? The John Ashworth mentioned above is probably John Davis Ashworth 1861-1918, son of Stephen J. Ashworth and his first wife, Jane Anne Nevin. In 1890 at the time of his marriage, John Ashworth was residing at Novinger, Adair County, Missouri. But who is Mr. Banford? It is probably one of the sons of George Banford. Tom Banford was about the same age but it also could have been George or one of his other sons, Joseph or William. I found several more articles about the Ashworth cousins by "casting a wider net." I was also happy to "spear" the above article about a most interesting real estate transaction. Happy trails until next time!